Generative design (GD) is the process of defining high-level goals and constraints and using the power of computation to automatically explore a wide design space and identify the best design options. While generative design applied for manufacturing is gaining more and more attention, its use for architectural space planning has been fairly explored. Generative design was used to design the AU Las Vegas 2017 Exhibit Hall layout, allowing the main stakeholders to discover a novel and high-performing design strategy. This article provides an overview of the process behind the design of the AU Exhibit Hall with technical and theoretical in-depth overviews of the generative design steps: 1) generate the design space through a bespoke geometry system; 2) evaluate each design through design goals; 3) evolve generations of designs through evolutionary computation. The design process typically involves the study of past precedents. And typically, designers achieve results that are efficient yet predictable. But what if designers started with fewer preconceptions and aimed to discover new unexpected results? After the use of generative design for the Autodesk MaRS Office in Toronto, The Living used the same process for designing the AU Las Vegas Exhibit Hall layout. Encountering some initial speculation, as this approach to design a temporary exhibition has never been done before, working through several iterations, the team delivered a design that responds to real world constraints and reflects Autodesk’s brand. Generative design for the MaRS Autodesk Office Project. Past AU Exhibit Hall layouts reveal design decisions developed through what are typically called ‘rules of thumb’ and human design intuition. 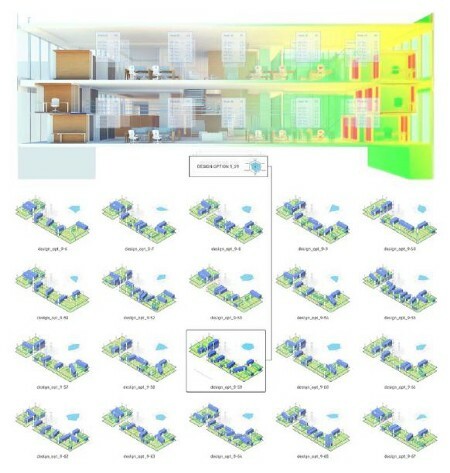 For example, the use of symmetrical layouts with a focus on the geometrical center of the hall, and clustering programs together or placing them in proximity to access points guarantees, according to past experience, the appropriate level of exposure. Borrowing the terminology from computer science, this type of approach to problem solving is called ‘heuristics’: simple strategies for problem-solving that have proven to be somewhat successful in the past. Although this approach is efficient, when applied to complex problems they generally do not yield to the best overall solutions. For this reason, computer scientists have introduced ‘metaheuristics,’ a set of optimization techniques that for a given complex problem they can find a set of overall best solutions by iteratively sampling solutions and using performance criteria to generate better and better outcomes. 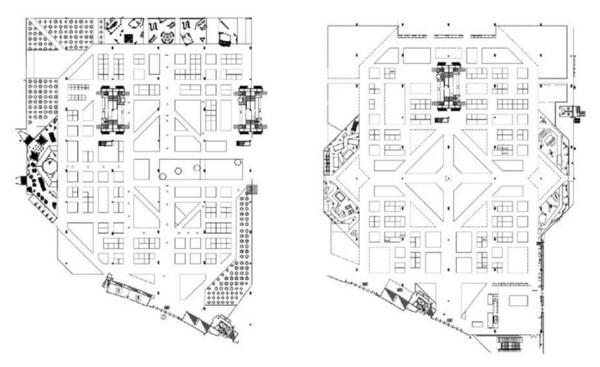 AU 2016 and 2015 floor plan layouts. By working closely with the AU team we were able to describe the full possibilities and goals of the AU layout. Through the application of generative design we set the goal of moving past these traditional layouts and rule of thumb decision making seen in previous years and discover new layout solutions that are both novel and high-performing accordingly to the specified design goals. Of course, not all design problems require generative design workflows to be adopted. The ones that are complex enough that a human alone is not able to solve are the appropriate type of problems that generative design should tackle. In our case, the design problem to solve was the following: within a given floor plan, how can we organize and distribute all the different programs while, respecting the constraints and requirements, maximizing exposure levels and buzz while simultaneously generating a novel and interesting design solution? 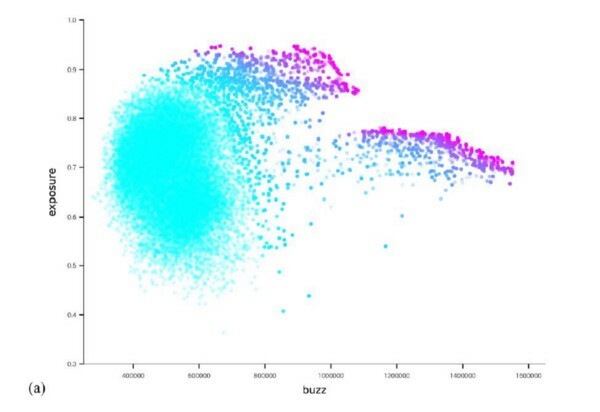 Generative design integrates artificial intelligence into the design process by using metaheuristic search algorithms to discover novel and high-performing results within a given design system. Its framework is dependent on three main components: 1) a generative geometry model that defines a ‘design space’ of possible design solutions; 2) a series of measures or metrics that describe the objectives or goals of the design problem; 3) a metaheuristic search algorithm such as a genetic algorithm which can search through the design space to find a variety of high-performing design options based on the stated objectives. Generative design (GD) belongs to a wider ecosystem. It is preceded by a phase we call ‘pre-generative design’ (pre-GD) and followed by one called ‘post-generative design’ (post-GD). Generative design for architecture workflow. The pre-GD phase involves working closely with the stakeholders and gather unique and critical data about the project that can inform the generative model and the evaluative component. The first step is data gathering. We collected information about the program SQF requirements and their relative adjacency and location preferences. 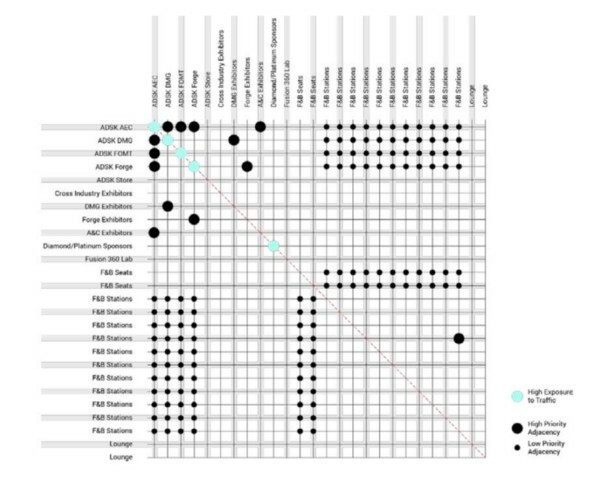 AU booths and pavilions adjacency matrix. Design constraints — Placement of a portion of all the Autodesk pavilions next to the main access points from the keynote hall. 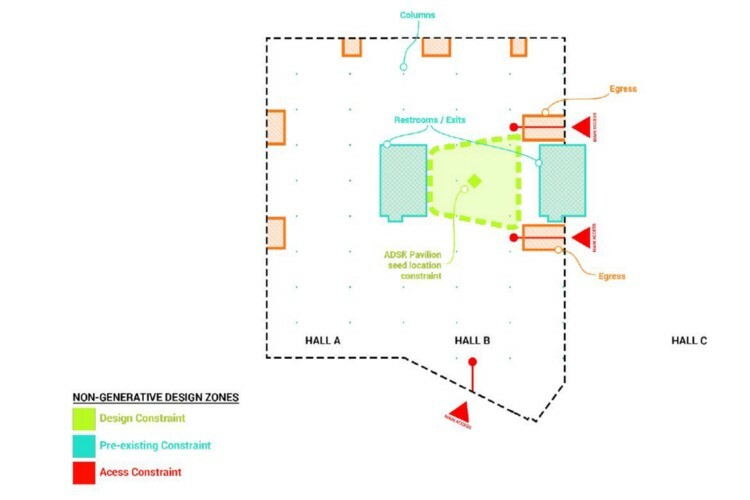 Pre-existing constraints — The Exhibit Hall boundary, columns location, egress areas, and central restrooms. Access constraints — Key fixed locations for access and exit of main space. AU Exhibit Hall site constraints. 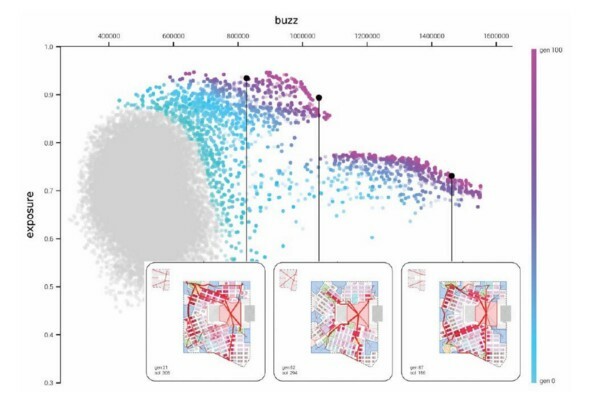 Buzz — As the measurement of the amount and distribution of high activity zones, visualized above as a web of red lines with varying thickness with the thickness signifying the amount of traffic. Exposure — Measurement of the proximity of the booths to high activity zones, illustrated by color coding the booths with a gradient that goes from white to red, with white being low exposure and red high exposure. 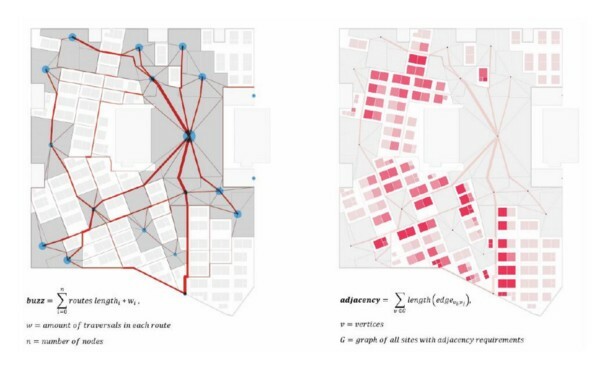 As mentioned earlier, GD is constituted by three main components: 1) a generative model that can describe a wide design space of possible solutions; 2) an evaluative component that comprises the specified design goals; 3) a metaheuristic search algorithm, in this case a GA, that can navigate the design space and generate better and better design solutions. Our geometry system is inspired by urban morphology and how cities grow. 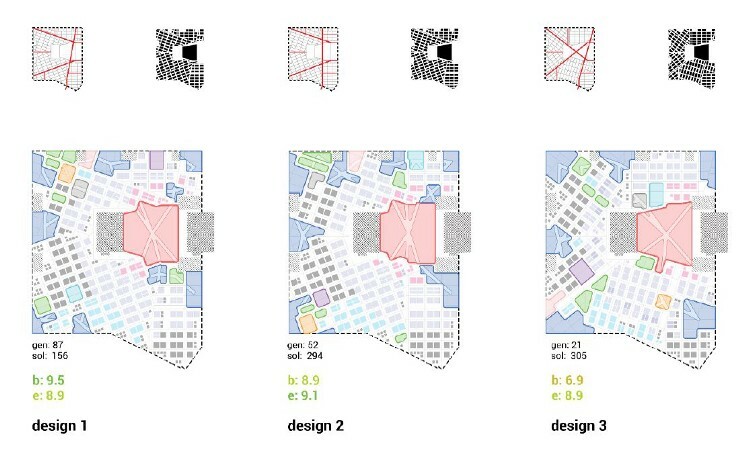 This strategy is advantageous as it can yield to very varying options: from irregular layouts similar to historical neighborhoods in European cities like Rome or Paris, to more regular ones like the city of New York. The developed geometry system is divided into subdivision and parcelization operations and program allocation techniques. 1. Define geometrical constraints and non-generative design zones. 2. Generate three or more major avenues that subdivide the Exhibit Hall in macro-regions. 3. A series of secondary avenues grow from the primary ones and subdivide each macro-region into two sub-regions. 4. Each sub-region is subdivided into cells through a grid of varying orientation. 5. Place ‘program seeds’ along the avenues. 6. Let seeds grow by uniting adjacent cells until relative SQF requirements are met. 7. Populate remaining cells with standard booths. Through the automated evaluative components each design is scored along the two established metrics. Such numerical values are used by the metaheuristic search algorithm to evolve high-performing designs and learn over time. For this project over 30,000 designs have been generated: 100 generations multiplied by 320 design solutions. As shown in figure below, the evolutionary component has learned to control the inputs in such a way to find different families of high-performing designs. In the post-GD phase the human component becomes critical. Aided by design space navigation tools, the human designer can explore the front of high-performing designs (Pareto front), navigate metric trade-offs and qualitatively judge design options. By directly inspecting a subset of high-performing designs, the designer together with the main stakeholders can hone in on a small set of candidate designs to be manually refined. Design space navigation and selection. Once the selection has limited the search to a handful of designs, manual refinement takes place in order to further develop the design and ensure constraints and requirements are met. 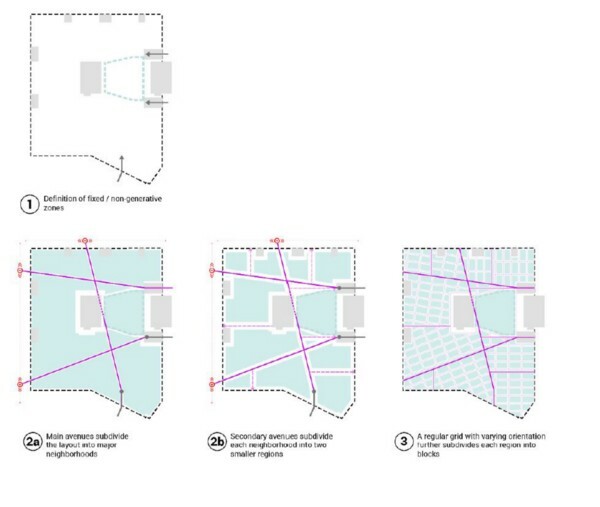 In our case, as a post-GD design feature, the high traffic paths have been used to generate primary circulation corridors that can also assist with wayfinding. 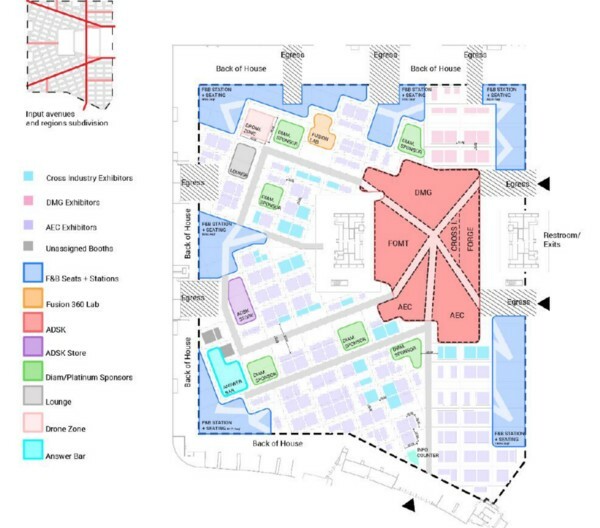 In a similar fashion, we use the predicted high traffic paths to divide the different main Autodesk pavilions which in turn can funnel visitors from the main access points to the respective industry booths. Three manually refined high-performing designs. Generative design for architecture is a new method of design that enables you to discover unexpected novel designs and navigate trade-offs between high-performing designs, sketch constraints, and goals rather than form and co-design between human and computer. Such methodology introduces new ways to think, make, and produce architecture, streamlining collaboration efforts between designers and clients while unlocking the creative power of artificial intelligence for designers and engineers.